"One final adventure in Middle-Earth"
It is the end of another journey in Middle-Earth and it will probably the last time we get to see J. R. R. Tolkien's fantasy world. As promised we get the massive Battle of the Five Armies, but the final entry of The Hobbit series suffers from being the most overblown installment with its numerous attempts at fan service, which cause it to be the weakest movie in the series. After Smaug has been awakened at the end of Desolation of Smaug he attacks Lake Town, raining death and destruction. Bard (Luke Evans) reluctantly leads the men of Lake Town to The Lonely Mountain to seek reparations as the many forces of Middle-Earth are drawn to the mountain. At The Lonely Mountain, the Dwarves prepare their defense but their leader Thorin Oakenshield (Richard Armitage) has gone mad as he looks for the Arkenstone as he becomes corrupted by the mountain and dragon-sickness. 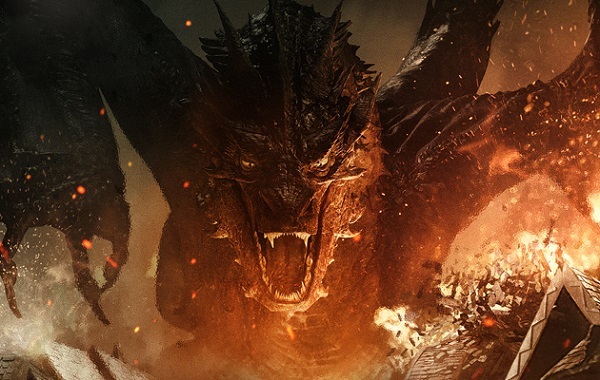 Battle of the Five Armies starts with gusto as Smaug attacks Lake Town, setting the town alight and killing numerous civilians, giving us the thrill as one man battles the dragon - setting up an even bleaker tone for the adventure ahead. In the ruins of Dol Guldur Gandalf (Ian McKellen) is rescued by some of Middle-Earth's most famous characters; but here is where some of the first problems arise as the characters of Elrond (Hugo Weaving), Galadriel (Cate Blanchett) and Saruman (Christopher Lee) are just cameos, with the movie setting up Saruman to take on Sauron but nothing comes of it; maybe we will get to see it in the Extended Edition. Battle of the Five Armies is a movie of two halves, the build up towards the battle as the armies set their positions, Gandalf trying to convince the Elves, Men and Dwarves that fighting amongst themselves would be a futile tack. The second half is the battle itself, a massive event as the forces move against each other. It is the action highlight of the movie but does not have the power of the battles in the original trilogy. It is a glut of CGI when the battles of Helm Deep, Osgiliath and Minas Ithil had a physicality to them: they were a mix of practical effects, models and CGI. Billy Connelly was brought into the movie as the red bearded Dain, a dwarf and Thorin's cousin: he was a CGI creation that is deep into the uncanny valley and uses a few British swear words which are out of place in a series that had little swearing. The battle is more like The Battle of Naboo in Star Wars Episode I: The Phantom Menace, being a battle on many fronts and very hard for any one moment to be focused on for a prolong period. There is the fight between the Dwarves and the Orcs outside the gates of the mountain, the men fighting for their lives in the city, the Elves being on every front and Thorin debating on whether to join the fight. It is over the top at times and it seems like Peter Jackson had asked for advice from George Lucas and Michael Bay for creature designs like a troll with artificial limbs and how to direct the action sequences: thinking bigger is better. The other comparison that could be made with Battle of the Five Armies is with Harry Potter and the Deathly Hallows Part 2: both are movies that set out to be conclusions for the series and basically long battle movies. Deathly Hallow Part 2 was stronger at its setup and structure then Battle of the Five Armies. It is also going to be the route that The Hunger Games: Mockingjay Part 2 is most likely to go down as mostly a movie focused on a battle event. This review has been negative so far but there are positives. The cast is still game and continues with Artimage being an excellent Thorin as he becomes an irrational, paranoid figure. Martin Freeman is given more time as Bilbo Baggins and the movie refocuses on the relationship between Bilbo and Thorin, swinging from respect and friendship to animosity. 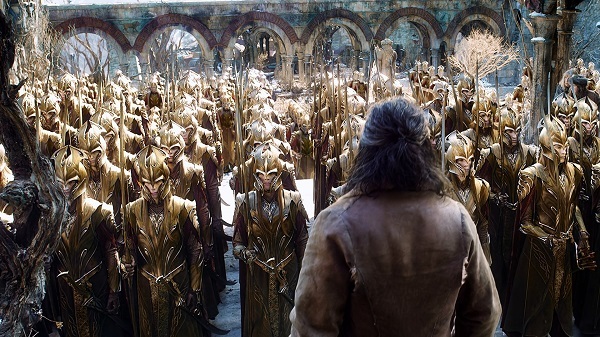 The Dwarves themselves are torn between their loyalty to their leader and seeing how irrational he has become. But the character of Afrid played by Ryan Gage was annoying as the comic relief coward and his character should have been cut from the movie. The Lonely Mountain was made to be a corrupting influence on many people, similar to the Ring of the Power. Thorin was affected by it, driven mad with guilt and paranoia, his grandfather and Elven-king Thranduil (Lee Pace) wants the jewels in the mountain. Thranduil is an interesting character, an isolationist who only joins the Men of Lake-Town out of convenience; then being compelled out loyalty or compassion. He is very different from the version in the books and shares some similarities with the movie version of Elrond. Expanding The Hobbit into a trilogy was always a questionable decision considering the book is short. The first two Hobbit movies, especially Desolation of Smaug, were able to use appendices and Unfinished Tales to expand the story. The Battle of the Five Armies is more of a loose adaptation with Jackson and his writers having to take more liberties to show the events of the battle in the wider context of Middle-Earth as the Kingdom of Angmar is set to reform. There was less material to work with and hence the long battle sequences. 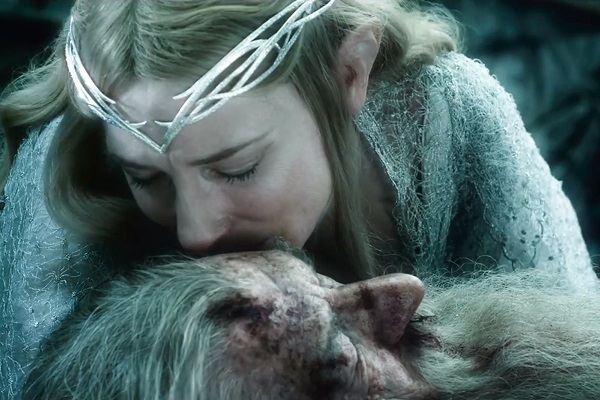 The Hobbit: The Battle of the Five Armies is a step down from The Desolation of Smaug, which got its tone and translation of the book to the screen right. Battle of the Five Armies ended up being more of an action blockbuster than the grand epic that made the original trilogy so special.